India's electronics security and surveillance market has grown considerably over the past few years due to rising security concerns and sustained growth of infrastructure in the country. The constant threat of terrorist attacks post Mumbai attack in 2008 as well as attack on the Indian Parliament has necessitated the deployment of surveillance systems in both public and private sector buildings. Commercial offices are increasingly deploying these surveillance systems to protect their infrastructure, data and enhance security in their compounds. According to 6Wresearch, India's video surveillance market is projected to grow at a CAGR of nearly 13% during 2017-23. Although, analog based surveillance systems have accounted for majority of the market revenues; however, growing awareness along with declining prices are likely to proliferate IP based surveillance systems over the coming years. The Northern region registered the highest revenue in 2016 with states of Delhi NCR, Haryana, Punjab, Uttaranchal and Uttar Pradesh being the major contributors. Hybrid video surveillance solutions are being widely deployed in this along with educational institutes, airports, railway stations and power plants. 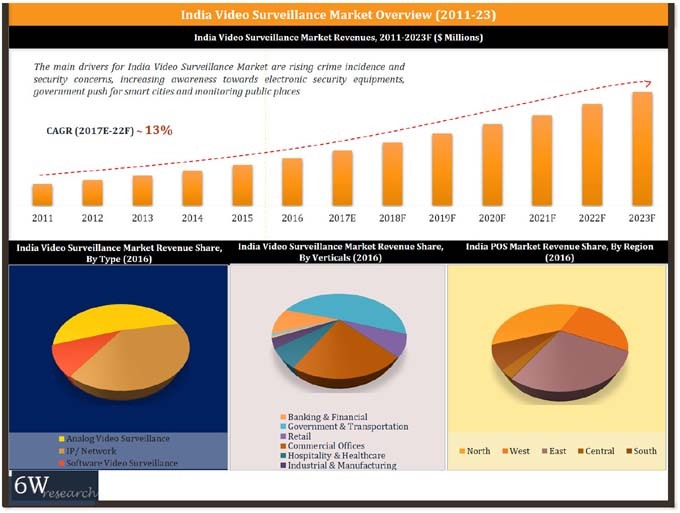 The report thoroughly covers video surveillance market by Types, Components, Verticals and Regions. The report provides an unbiased and detailed analysis of the on-going trends, opportunities/ high growth areas, market drivers which would help the stakeholders to decide and align their market strategies according to the current and future market dynamics. 14.2	Bosch Security Systems, Inc.
14.3	CP Plus India Pvt. Ltd.
14.5	Hangzhou Hikvision Digital Technology Co. Ltd.
14.6	Hanwha Techwin Co., Ltd.
14.8	Panasonic India Pvt. Ltd.
14.11	Zhejiang Dahua Technology Co., Ltd.
14.12	Zicom Electronic Security Systems Ltd.